Kefir ‘grains’ (a symbiotic community of probiotic bacteria and yeasts in a polysaccharide and protein matrix, not actually a grain of any kind!) originate from the Caucus Mountains, an area famed for the longevity, health, and overall freedom from disease of its inhabitants. The grains are so esteemed within the predominately Muslim communities of the region, that they are held to be a gift from Allah, and a sign of God’s love for humanity. 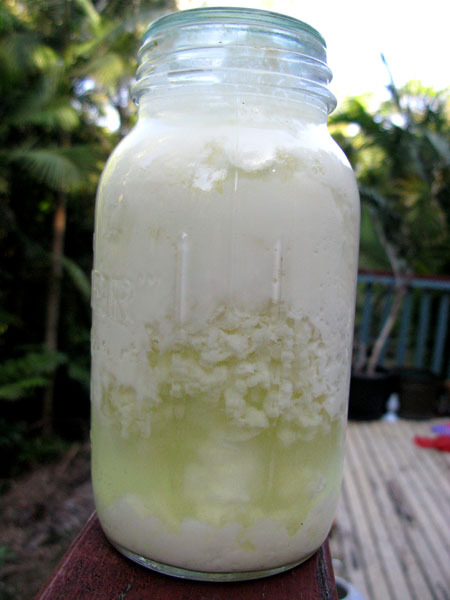 Kefir drinks are the product of the action of the kefir community on a liquid substrate. The substrate was traditionally milk, but ‘milks’ of various nuts, legumes and (actual) grains are often used in today’s society. Lactose intolerance should not necessarily prohibit us from enjoying milk kefir, because one result of the actions of the pro-biotic bacteria and yeasts within the kefir community is that lactose is converted to lactic acid, especially where we give the milk a secondary fermentation period. 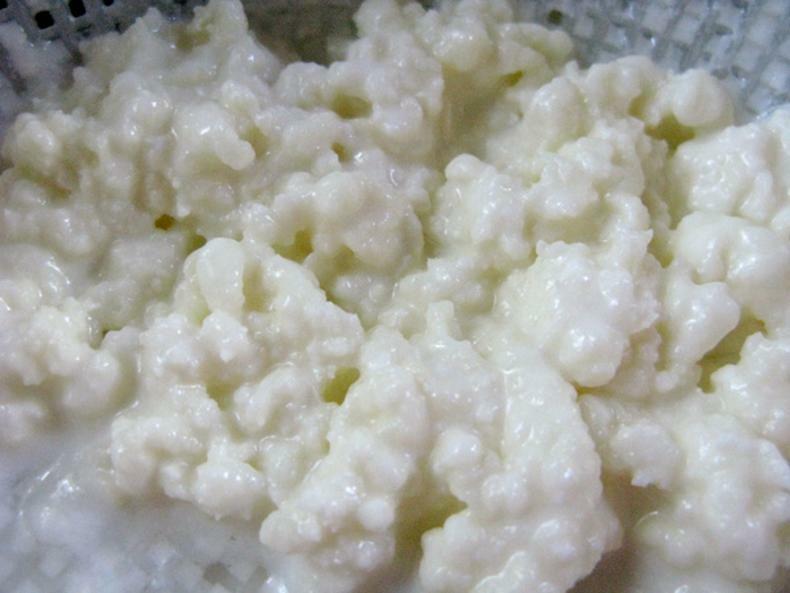 Agitation of the grains and milk during the fermentation process encourages the desirable health giving and sensory characteristics of kefir milk, and traditionally this has been used as a vehicle for the expression of higher love by the people of the Caucus Mountains – kefir was hung in goat bladders on the door jam, and as people entered a dwelling, they would rub the bladder vigorously, wishing good fortune upon the household they were entering. We can do the same today - as we agitate the brewing kefir we can hold the love we have for those we will share it with in our hearts, and we can hold the love we share with all through the bond of our common humanity. The chief component of the kefir colony matrix, a polysaccharide called kefiran, is produced by Lactobacillus kefiranofaciens. Kefiran is a water-soluble glucogalactan (equal parts glucose and galactose), and kefiran production has been demonstrated in L. Kefiranofaciens isolated from the community. Production is much increased however in the presence of the yeast Saccharomyces boulardii, underlining the symbiotic and synergistic nature of the kefir community. This symbiosis extends to the production of metabolic by-products that serve to provide energy and growth factors between the functional groups of bacteria and yeasts, and to inhibit food contaminants and pathogens. Isolated microorganisms of the kefir community tend not to grow and feed well in milk, and/or have much reduced biochemical activity. The synergy of community is again seen in nature where the effect of the whole is greater than the mere sum of the parts. The different species work together for a greater common good than could be achieved in isolation and this effect also extends to the way they work for us when we drink kefir fermented milk, in combination and synergy with the unique compound kefiran. In addition to this, the milk substrate has a pH buffering effect for the probiotic organisms, ensuring that they reach the intestine through the harsh environment of the stomach intact, and in high numbers. Kefiran, that major component of the colony matrix, is also contained in kefir milk, and it has been shown to have many benefits for us. Briefly, kefiran (either alone, or in conjunction with other metabolites and organisms within the kefir milk) has been found: to exhibit anti-tumour activity; to be anti-mutagenic; to have high antioxidant activity; to initiate a systemic anti-inflammatory response; to lower high blood pressure and serum cholesterol; to enhance immune function; to improve overall gut health and function; to improve bowel function and normalise stool moisture; and so much more. In fact, kefiran has been shown in trials to be beneficial to more than 100 recognised medical conditions, and that number grows year by year as more studies are conducted. Kefir milk, contrary to misconception, actively guards against overgrowth of Candida albicans through: displacement by probiotic yeasts; reduction in growth, adhesion and biofilm formation; and general overall improvement of the local micro-biota (restoration of balance within our internal ecosystem). Kefir milk contains pro-biotic yeasts, but I have never encountered evidence in the course of my extensive research that C. albicans is found in kefir milk. In fact, research exists that kefiran and some bacterial and yeast strains are actively antagonistic not only to C. albicans, but to other pathogens, including those in the well known genera (but not limited to): Salmonella, Listeria, Helicobacter, Staphylococcus, Escherichia, Enterobacteria, Proteus, Bacillus, and Streptococcus. Probiotic effects of kefir yeasts include: anti-inflammatory activity; prevention of intestinal mucosa damage by bacterial toxins; immune system modulation; elimination of enteric pathogens; assistance in restoration of normal gut function after antibiotic use; degradation of phytates (plant defensive compounds); increased mineral absorption from foods; folate biofortification (prevention of foetal neural defects, megaloblastic anaemia, Alzheimer’s, heart disease and cancer); absorption of mycotoxins (from mould and C. albicans); and degradation of mycotoxins (from mould and C. albicans). There are isolated reports of one yeast (C. kefyr) within the kefir community leading to overgrowth similar to C. albicans, but this is only in individuals with severely compromised immune systems (for example, after intensive chemotherapy and stem cell transplants in leukaemia patients), and this yeast has also been isolated from conventional, pasteurised milk samples. This indicates some caution is required if you have a severely compromised immune system, even though this condition is rare. Scientific literature reports lactose intolerant individuals consuming kefir fermented milk with none of the side effects that present when unfermented milk is consumed, due mostly (but not entirely) to activity by bacteria of the genus Lactococcus, which are highly efficient at metabolising lactose. Similar results are reported for people who have difficulty digesting milk protein, though this is due mostly to the action of probiotic yeasts, which hydrolyse milk protein and synthesise complex B vitamins. Secondary fermentation may also increase the levels of B vitamins, but research shows mixed results that may be dependent on the provenance and quality of both the milk, and the grains. Other research indicates that the fermentation process restores enzymes destroyed during the pasteurisation process that are essential for calcium assimilation within the body (alkaline phosphatase), and for lactose digestion (lactase). Kefir has also been shown to assist in protein digestion and to have a lowering effect on the glycemic index (so kefir is a low GI food). Kefir is mildly alcoholic, secondary fermented kefir is slightly more so, but the alcohol content is fairly negligible, so kefir is suitable for children. Primary fermentation will yield an alcohol content of ≤ 0.5 %, while kefir fermented for longer than 2 days in a secondary fermentation may rarely peak as high as 2% alcohol. Please be aware of this. Lactobacillic fermentation of milk is known to produce glutamic acid (a glutamate precursor), but at least one species present in kefir grains (Lactococcus lactis subsp. lactis) has been shown to convert glutamic acid to GABA (γ-aminobutyric acid, the body’s primary neural-relaxant). GABA containing fermented milk products have been shown in trials to reduce blood pressure in hypertensive patients, a result that can be consistent with our current understanding that GABA rarely passes the blood brain barrier. When ingested, our assumption is that GABA acts not on the central nervous system, but on the peripheral nervous system, where it appears to inhibit perivascular nerve stimulation and noradrenaline release. Regardless of the action, ingestion of a neural relaxant as opposed to a precursor that is preferentially converted to a nerve exciter in a body subjected to stress (as all bodies in the modern world are to some extent) can only be a good thing in my opinion. To enhance these effects, kefir milk may be added to fermented oat porridge, another GABA promoting food. The oats are placed in a glass or ceramic bowl at the ratio of 1:2 oats to water with a pinch of salt. After 24 hours, the porridge is prepared as normal, and the kefir milk added in the place of standard milk. A sprinkling of the powerful anti-inflammatory spice cinnamon will enhance both the taste, and the functional food aspects of the porridge. If sweetening is needed, raw honey or maple syrup will not counter the good work of the fermented oats and kefir. Before we look at how to make it, it is worth saying kefir milk not only contains the traditional probiotic strains found in yogurt, it contains many that are unique to kefir, and it contains them (measured in colony forming units/ml) in much greater number. It also contains diverse strains of probiotic yeasts, and strains of both probiotic bacteria and yeasts that colonise the intestinal tract (as opposed to the transitory nature of most yogurt probiotics). Lastly, a quick look at the counts of the types of probiotic groups found in a typical kefir analysis (CFU/ml). Lactococci: 1,000,000,000; Leuconostocs: 100,000,000; Lactobacilli: 5,000,000; Yeasts: 1,000,000; Acetobacter: 100,000. OK, let's make some kefir! You will need two 750 ml – 1 litre glass jars, a ceramic or glass bowl, a plastic strainer (though stainless steel is OK), some kefir grains, and some full fat, unhomogenised milk, raw if you can get it, though of course I am not inciting anyone to the criminal act (in some countries) of buying raw, natural milk. Step 1: Place the kefir grains in a jar, the ratio we want can be as small as two tablespoons or up to eight tablespoons per litre of milk. 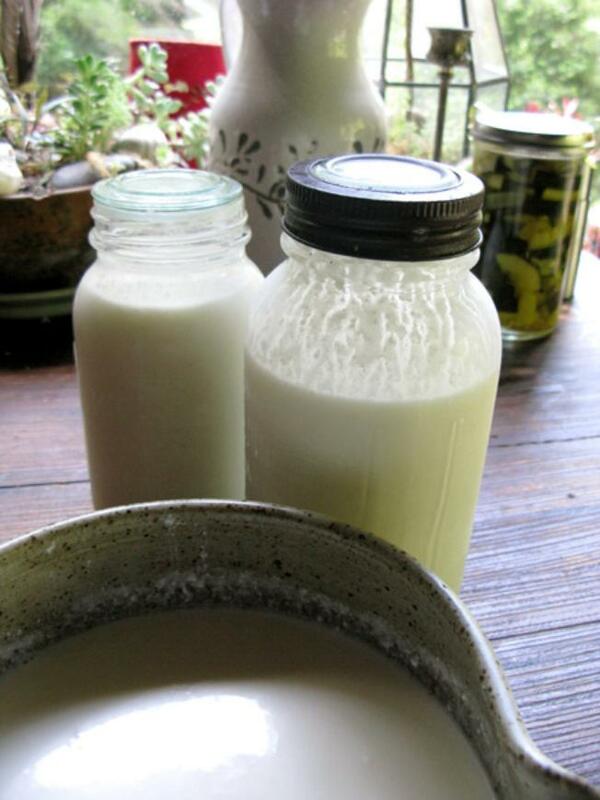 I use just under 8 tablespoons, a ration of about 1:8 kefir to milk, when the weather is cold, but less when it is hot. A good rule of thumb is at least 1 tbsp of grains per cup of milk. Step 2: Top up with room temperature milk, leave a little space for expansion. Place the lid on loosely, or cover with a tightly woven cloth. I use Mason jars with a glass lid, I sit the glass insert on the lip of the jar without screwing on the metal lid, and that works well. Leave sitting on the bench, but out of direct sunlight for 24 – 48 hours. After some hours of fermentation have passed, give the jar a gentle rotation every now and then to bring unfermented milk into contact with the grains, and to distribute organisms off the surface of the grains into the milk. Another option is to stir gently with a chopstick. Step 3: Place your preferably non-metallic strainer (in my experience, kefir grains aren't crazy about metal, but it is OK for brief contact) over a ceramic or glass bowl and pour the milk and grain mixture into the strainer. Don’t be alarmed if the milk has separated into curds and whey,* just give the jar a gentle shake to make straining easier. With clean hands, gently work the mixture so it drains through the sieve, leaving the kefir grains behind. I use the plastic basket that comes when you buy a kilogram of ricotta cheese, and this works very well. Step 4: Place the retrieved grains in a clean jar, and top with milk to start a new batch. Pour the kefir milk into a jar and seal tight. This may be refrigerated immediately, or left on the bench for secondary fermentation for a day or days. The longer the kefir is fermented, the foamier and thicker it gets. Always shake the jar of kefir before drinking for maximum enjoyment. 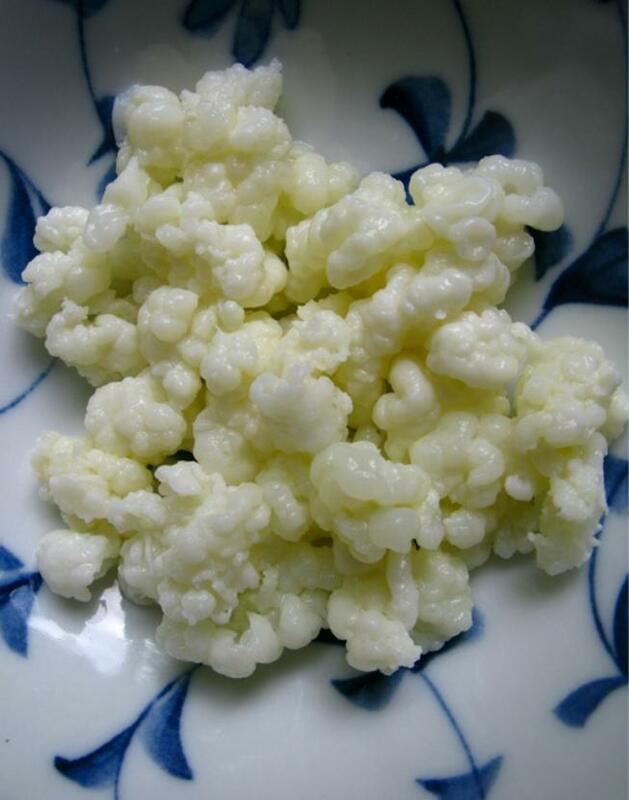 * Kefir whey is the clear to pale green or yellowish liquid, and is a powerful fermentation starter culture. I recommend only use whey for dairy based ferments, it is neither necessary nor appropriate for vegetable ferments, no matter what you have read or heard elsewhere. Kefir can be sorted into a wonderful sour cheese and whey by draining through muslin for a day. Above: the left hand photo shows the separation of curds and whey after 24 hours of warm weather. The right hand photo shows the same kefir after 48 hours. This is perfectly normal, don't panic! Secondary fermentation reduces the lactose content in the milk substrate, and increases the levels of available vitamins, minerals, enzymes, amino acids, and probiotic organisms. It also adds layers of additional subtlety to the taste of your kefir, and the composition and mouth feel are likewise much improved. After straining the kefir milk, transfer to a sealed jar for secondary fermentation. Leave enough room for expansion, a few inches at least. The lid can either be left a little loose to allow the escape of gas, or kept tight to build up effervescence. If keeping the lid tight, burp the jar periodically to relieve pressure. Secondary fermented products in glass can and do explode if they are not monitored. Shake the jar every now and then. If you are keeping the lid loose, make sure you tighten it first before shaking the jar. Leave the jar out of the fridge for one or two days. After two days, transfer to the fridge. The kefir can be enjoyed straight, or with the addition of herbs, fruit, honey, spices or other ingredients as personal taste dictates. Some suggestions will be found further elsewhere on this site, with links below. 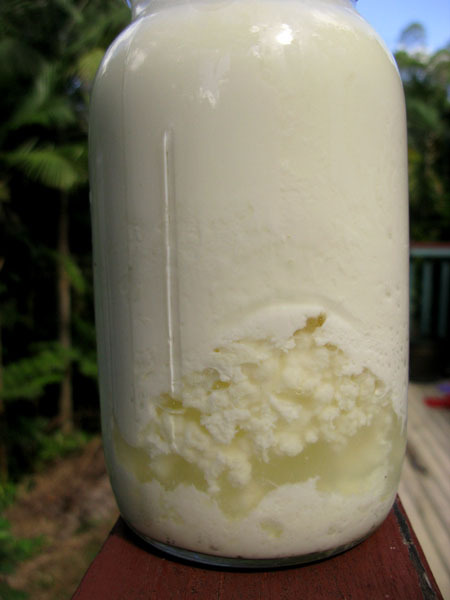 So for continuous kefir enjoyment, there are four stages: the kefir grains in the milk for primary fermentation; the drained kefir, ready to enjoy, or to move on to secondary fermentation; secondary fermentation outside of the refrigerator; and the final product, with or without addition, kept in the fridge. Always shake the jar before drinking kefir. Secondary kefir develops a rich, bubbly composition, like a thick milky beer, and this is enhanced with a bit of a shake up. Tradition has it that the people of the Caucuses would leave their goat milk kefir in bladders of goatskin by the door, and anyone who passed by would rub or pat it as a blessing, and for good fortune. This worked to create the effervescence we recreate with shaking the jar during second ferment. When we shake the jar today, we can add our own blessings to our loved ones, to the spirit of the animal who gave us her milk, and to the spirit of the microbiota that create such a tonic for our health.